Tawa Intermediate School, Wellington; Belfast School, Christchurch; Churton Park School, Wellington; Levin Intermediate School, Levin; Newlands Intermediate School, Wellington. This project engaged a team of school principals and university researchers to collaboratively investigate the effective e-learning leadership strategies employed in one school in order to make these visible and accessible for other school leaders. The project was initiated in response to the need to increase the knowledge, capability and understanding of school principals to take advantage of the changes enabled by the Ultrafast Broadband in Schools (UFBiS) initiative and the provision of networked services by Network for Learning (N4L). Examining the leadership practices of one principal through the questions and genuine interest of a group of principal colleagues, facilitated by participatory research processes sustained over a 2 year period. Building leadership capability by supporting the principal colleagues to adopt, adapt and implement digital technology strategies within their own schools, supported by their peers and the research project team. While increased broadband capacity and improved networked services offer many potential benefits for schools, harnessing technologies to raise achievement and improve learning outcomes for students requires transformative change enabled by pedagogic and cultural shifts (Bolstad, et al 2006; Davis, in press; Gilbert, 2005; Levin & Schrum, 2012; Schrum & Levin, 2009). Human factors are the most critical in the effective adoption of any technology: in education it is school leaders and teachers who have the greatest influence on how digital technologies can support improved educational outcomes. Leadership strategies must impact interacting ecologies of the schools and whānau (Davis, in press). The MOE has therefore identified strategic priorities of strengthening school leadership, effective teaching and assessment in order to lift student achievement. The project adopted an in-depth, collaborative case study investigation of one intermediate school that was purposefully selected (Maxwell, 2005) for its intrinsic value. The pilot study conducted in 2012 provided evidence that the school was operating at the ‘Extending’ and ‘Empowering’ levels of the e-Learning Planning Framework (MOE, 2014) with digital technologies firmly embedded and integrated in the vision, culture and practices of the school and influencing the five dimensions of the framework. Data were collected from the case study school via observations; interviews; analyses of documents, meeting notes and websites; and complemented by walk-throughs which enabled all of the project team to see the case study school in action on several occasions. This case material provided a vivid backdrop to the study but the real details and insights emerged from the sustained conversations recorded between the participating principals and the lead principal during the regular face-to-face meetings. These meetings enabled ideas to be revisited, and the strategies, implications and effects of leading digital technology initiatives within the school were discussed and interpreted over time. Davis, N.E. & Mackey J. (2015). Co-evolutionary perspectives on innovation with digital technologies in education. In Andrej Brodnik, Cathy Lewin (Eds.) Presentation within symposium at IFIP TC3 Working Conference “A New Culture of Learning: Computing and next Generations”, Vilnius, Lithuania, 1-3 July. Davis, N., Mackey, J., & Stuart, C. (2015). Leadership strategies for a future focused intermediate school – a case study. Paper presented at the American Educational Research Association Annual Conference, Chicago 16-21 April, 2015. Available in the AERA Online Repository. Stuart, C., Henderson, B., Jeffries, T., Lye, A., Mackey, J. & Davis, N. (2013). Leading and preparing for transformative change enabled by Ultra Fast Broadband. Presented at the ULearn 2013 Conference, in Hamilton, 9-11 October 2013. Davis, N. E., Mackey, J. & Stuart, C. (In Preparation). Systems thinking in technology rich schools. A dynamic leader’s model to spin success from the top. Journal of Research on Technology in Education. Mackey, J., Davis, N., & Stuart, C. (with Henderson, B., Rickard, K., Lye, A., Jeffries, T., & Simpson, P.) (2015). Leading change with digital technologies in education, SET Research Information for Teachers, (2), 17-25. Stuart, C. (2014). Six keys for digital leadership. New Zealand Principal, 29(3), 6-8. Stuart, C., Henderson, B., Lye, A., Jeffries, T., Rickard, K., Simpson, P., Mackey, J., & Davis, N. (2015). Extending innovative leadership to enable e-learning for better student outcomes in primary schools. 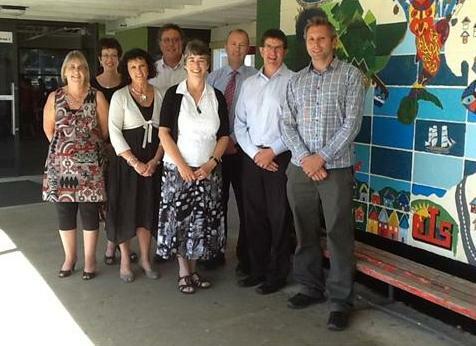 New Zealand Principal, 30(1), 10-12.
with a case study of innovative leadership in a future focused school. Presentation to postgraduate students in EDEM682 Transforming Education in Canterbury.